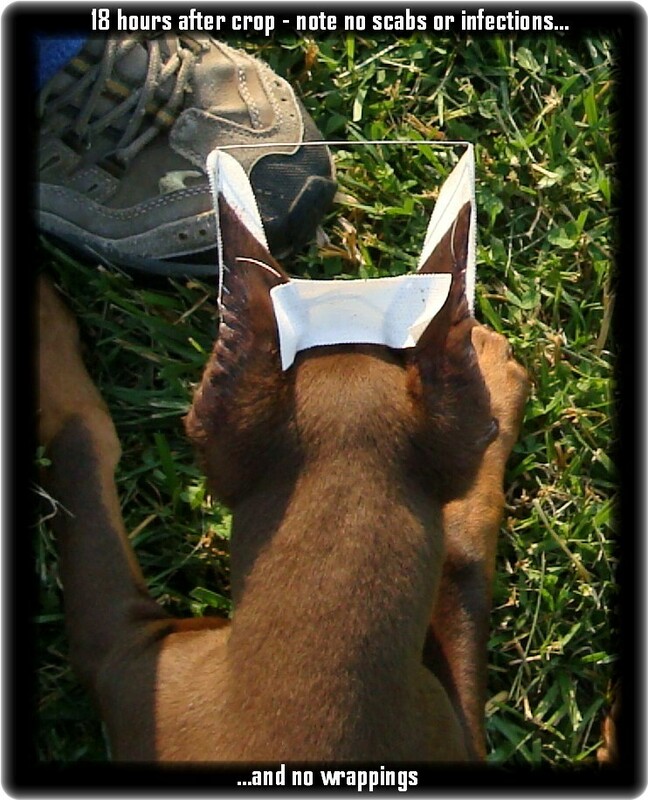 Ear Taping System "The Quick Brace"
The best, most effective, lightweight, easy to use brace system for dog ear stance. Most comfortable brace for dogs, will not rub on open wounds or head causing further discomfort..
We understand the art of Ear Stance Training with more then a million applications. Note the Quick Brace is so light you can even see through the brace - even see the ear crop design in this photo. The tape running up and down between the brace is the cheapest masking tape so Riley can play with friends, also keeps the brace from catching on most objects like plants when outdoors. Over all the Quick Brace was also designed to be the lightest possible form of taping or posting (at just 17 to 20 grams) while other processes are 200 to 600 grams and up heavier. There are angles added to the Quick Brace to match the natural shape of the ear and every brace is hand formed according to your dogs head size and correction need. Our youngster below happened to show off the lightness of the QB when we were photographing her for her new family with the sun behind her. A most informative video ever produced covering ear stance training and you don't have to wrap the ears. A help in showing off the quality of a crop immediately after surgery. No more taping ears the antiquated way. The most comfortable way to train ear stance even if the dog is over eighteen months of age. Also an excellent way for the surgeon to truly show their quality of service without the need for you to wait until the messy wrapping types of applications come off. No more running to the feminine hygiene isle at the drug store, the plumbing department at the hardware store or the picnic department for coffee cups. The easiest to apply and most comfortable system for ear stance training ever designed, more then one-million braces applied since it's introduction - everything you need comes with each Quick Brace Kit including a hot line when you have questions. HOT LINE ... 865-397- 9406 or email us at Oreders@hoytt.com /Quick Brace. Voted the most humane system every designed for ear stance training by it's usurers. For crop breeds, most vets apply before the dog Once home applying new braces take just a few minutes and you save a trip back to the vets or the breeder and no hidden fees related to office and service charges. Note for those Breeders and Veterinarians who use the Quick Brace after crop and/or during stance training - we would like to let the world know you are not like those other guys ...We are now ready to link from our QB site to yours at no charge - just contact us. No running to hardware store, drug store or even Wal-Mart everything you need comes with your Quick Brace Kit...So forget spending an hour or more trying to put together an apparatus that should have been banned decades ago. Leave ear racking discomforts behind - forget hair loss from tape removal, forget ear taping infections because you do not have to wrap the ears. In fact forget ear taping completely use The Quick Brace System and give your 'kid' a break. Leave the irritations of taping to those who seem oblivious to the canines discomfort and you no longer have to worry that you or your 'expert' wrapped the ears so tight you lose the tips of the ears from lack of blood circulation. 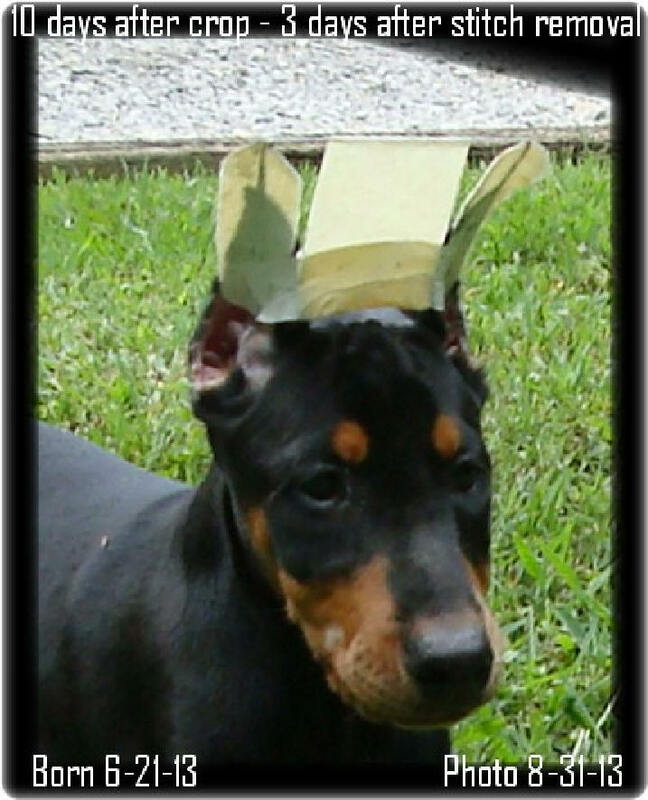 Our compliments to those breeders who's canines require ear stance and who have spent years creating a home taping system but the more we read the more dangers have been faced from content of adhesives causing negative reactions to shrinking of wraps used that cut circulation damaging ears or the injuries due to pushing the sticks and rolls too deep into the surface ear canals. Most ear taping or posting shown on the web have been done by folks who are doing their best but face to many of the negative unknowns thinking their idea is better then others. But then we have the serious breeder who has spent years never knowing about the Quick Brace while they unknowingly believed they had a better system then the other writers. While they spent years of testing to create their favored system yet still retaining the negatives they have to advise you about. Well for many of us today even an oil change is something done best by those who know what to remove, what to add and what to remember to tighten or our vehicle becomes seriously damaged - but it is after all not usually the love of our life's health at stake. So why not go for the one system that is designed to fit your dog and arrives with everything you need. Read up on the many hundreds of advisories on taping and you find an equal amount of warnings from the negative difficulties they have run into. The many warning about tapes, glues, even damage of the ears and you quickly become confused. Now think about the Quick-Brace, one negative might say the QB is too simple to work, an other had the nerve to say a ready to apply Quick-Brace at less then an eight dollars application it just too much to pay even though a can of the wrong glues, wrong tapes wrong Tampex, wrong plastic, medal, of wood inserts damage ears at times to the point of serious destruction of the ear and hundreds if not a thousand dollars at the vets for damage repairs. Now compare the Quick Brace System experiences with more then one million applications, one-million or better yet the two-million ears that the QB has been applied to with success and you have a serious idea about the knowledge that is behind each kit. Keep in mind every aspect of this System of posting has been an on going test of the product which passed 1,000,000 applications to date. In the end it's the lightest, most comfortable that the dog no matter how much it hated all you've put on its head to date before you knew about QB soon forgets after a couple of applications it's even on their head. Actually that has been said to be the negative side QB because forgetting its on their head they can sometimes hook it on some of the strangest objects but even that is preventable when you add correctly a cheap light masking tape as shown in our QB Video filling in the area from the cross tape to the top cross bar. So with a system for a fresh crop that weighs less then 17 grams and no use of DUCK TAPE - again the Quick Brace has no equal. when ordering a Post-Surgical Kit. ** International shipping available at additional cost. 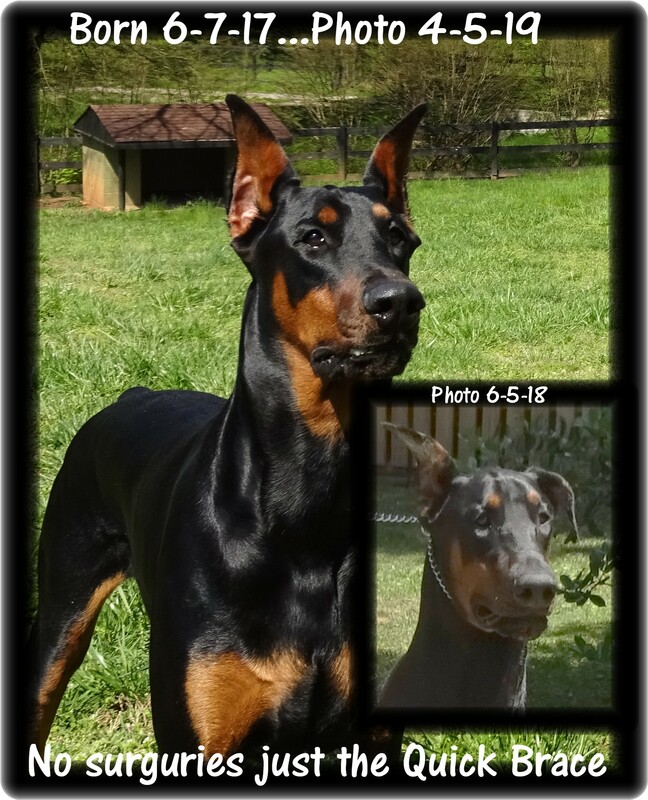 Noah - Star baby born 9-3-18- Reserved formally Hoytt's Master of the Unitas. Heading to Utah after completing the Grand Victor Program. Paul -Zoey blue pup / Now in San Francisco area with Lilo - their people are well established clients who drove in to pick them up. Poppy - Delilah & Major pup ... now home in Bridgewater NJ with her other half Winslow. Scylla & Caspian pup Lazarus ... Our youngster here now resides in Plymouth Mass following completion of our medical services. And yes his new dad is an established client.